This is the latest version of PhiPsi which is written in Fortran. The new features and bug fixes of PhiPsi can be seen from here. 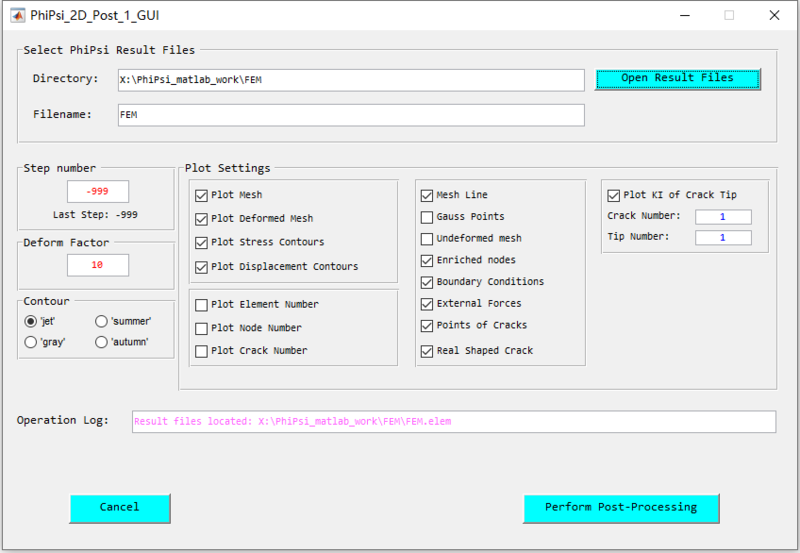 This PhiPsi Post-Process GUI (Graphical User Interface) program can be used to analyze the results generated by PhiPsi, plot deformed mesh, plot contours, generate gifs, and so on. This GUI program was written in Matlab R2017b. If the MATLAB R2017b is not installed, please download and install the Windows version of the MATLAB Runtime for R2017b from http://www.mathworks.com/products/compiler/mcr/index.html. Afterwards, Microsoft Visual C++ 2015 should also be downloaded from http://www.microsoft.com/en-us/download/details.aspx?id=53587 and installed. The source codes of this program without GUI is available for downloading from the next section of this web page, i.e., 'The source codes of the PhiPsi Post-Processor written in Matlab'. This Matlab program can be used to analyze the results generated by PhiPsi, plot deformed mesh, plot contours, generate gifs, and so on. The new features of PhiPsi Post-Processor can be seen from here. ○ Tutorial and related files. The usage of keywords of PhiPsi is illustrated in the manual. Source codes of an earlier version of PhiPsi with limited functionality are available here. PhiPsi is written and compiled in a Fortran development environment called Simply Fortran, so you have to download and install Simply Fortran to compile the source codes. Of course, you can also compile the source codes using other fortran compilers, such as intel Fortran compiler or gfortran compiler. In addition, the Matlab program Post-Processor Version 1.1.7 is suggested to post-process the result files generated by the source codes. Please cite the papers listed on this page if the presented source codes are helpful. A macro is adopted to get the preprocessor files from ANSYS to PhiPsi. The following tool written in Python 2.7 is used to delete all of the result files generated by PhiPsi. If Python 2.x has not been installed on your PC, please download and install it. The following tool written in Python 2.7 is used to monitor memory usage of PhiPsi. The following batch files are used to run PhiPsi program in command prompt in Windows operation system. The following beta program is used to extract input files of PhiPsi (including *.ndoe file and *.elem file) from the inp file generated by Abaqus. The PhiPsi GUI is the graphical user interface for PhiPsi written in Visual Basic.NET within Visual Studio 2015. It is designed for pre- and post-processing for the calculation kernel of PhiPsi which is written in Fortran. Microsoft.NET Framework 4.0 should be installed to run PhiPsi GUI. If you want to use the Python tools provided in PhiPsi GUI, Python 2.x (Python 2.7 is suggested) should also be installed. Since the current version of PhiPsi GUI is still a beta version, some functions are not available yet. Therefore, pre-processing using ANSYS and post-processing using Matlab are suggested if the problem to be solved is relatively complicated. However, the author will continue to add functions and improve stability in the coming versions. A tutorial of PhiPsi GUI can be found by clicking Help toolbar button and then clicking PhiPsi GUI help manual.